Is it still $10 if I play fewer than 4 games? Tell me about the new word list (OWL3)? What is a Director? How can I become a Director? All levels are welcome, from beginner to expert. The first time is always free, but subsequent visits require a $10 fee, collected during the first game. Games begin at 6pm, but you should try to get there by 5:45pm your first time--don't be late! Get off on North East Campus Parkway--the first stop after the University Bridge (tell the driver). Cross 9th NE, turn right and the University Friends Meetinghouse is on the left about 100 feet. You'll want to leave downtown before 5:30pm to make it to the first game...but you could arrive later and start with the second round. Note: alternatively, you can take the #71 Metro bus from the bus tunnel and get off at the same stop. Returning from club to downtown Seattle, catch the #71 Metro bus from the bus stop on the triangle/island across from UFM. Players of all ages and abilities are welcome at club, but be aware that all players are expected to keep score for themselves, play by the rules, and use a clock (game timer). Also, the official word list is NOT abridged, so some words that may be "offensive" are acceptable for play (see expurgated word list for words acceptable for club & tournament play that are not listed in the OSPD). Please use your own judgment to determine if your child is mature enough for this environment. Children under 15 must be accompanied by an adult. Since club starts at 6pm and goes until 10pm, most folks eat dinner beforehand (or wait until afterwards to eat). You can bring food to eat, but you should plan to eat between games since there isn't a lot of extra room at the tables when you are playing, and no one wants food on their equipment. NOTE: You are required to take your trash and recycling away at the end of the evening, so if you bring food please be prepared to clean up after yourself. See news link: Please pack out your trash and recycling. If you are looking to purchase food, the closest place is Campus Teriyaki, at 41st & Roosevelt, about a block and a half away. There is no marked crosswalk across Roosevelt at 41st, so be careful crossing (or go up to 42nd where there is a light). There are many other food options further away, along 45th or University Way. We ask that you TURN YOUR CELL PHONE RINGER OFF when you enter our club space and do not answer or place phone calls in the playing room. If you need to make a call or answer the phone, please step outside. No one wants to hear your phone ring, or your telephone conversation. You are not allowed to use electronic devices (including cell phones, bluetooth earpieces, google glass, etc.) during games. That includes checking for text messages, email, etc. If you are expecting an urgent call or message, please let your opponent know before the game starts and make sure your phone ringer is OFF. No. Deluxe boards and Protiles are always welcome though, if you have them to bring. Interested in upgrading your equipment? Check our Links Page for a list of people who sell custom boards, Protiles, clocks, tile bags, etc. What are those weird timer things sitting on the tables with the board, racks and tile bags? Those are timers. There are several makes and models, from analog chess clocks to electronic timers made exclusively for SCRABBLE® play. It takes a while to get used to them. When you have placed your word on the board and announced your score, you hit your timer to indicate the end of your turn. The opponent's timer and turn are started. Interested in upgrading your equipment? Check our Links Page for a list of equipment vendors. No. Score sheets are provided at club. However, we do recommend you bring your preferred writing instrument. You can print out your own copies of the Club Score Sheets if you wish. We provide two versions: Horizontal Score Sheet [pdf] and Vertical Score Sheet [pdf]. They are formatted 2 games per page (print double-sided for 4 games per sheet). For links to lots more Score Sheets, check the Forms section on our Links page. Note: some folks print out a few hundred score sheets and have them bound into a book for easy transportation and organization. Up to how many games may we play in one evening? If you limited yourself to one opponent at a time, up to four. Yes, it's $10 even if you just play one game. The costs for the club are the same whether you play just one game or all four--you still use a score card, a score sheet, and use the room. If we lowered the rate for players who only play 1 or 2 games, we'd have to raise it for the rest, and that wouldn't be fair. Remember, it's still a bargain. Starting August 2018, Club director and statistician will pay a discounted rate of $4 (the had been paying nothing for several years). If you can't make it to Tuesday Club, there are some other SCRABBLE® get-togethers around the area. Some attract tournament-style players, and others are more laid-back. Take your pick! Sunday afternoons: Many Seattle Club members meet every Sunday in Lake Forest Park. When: Games start around 2 pm (and go until everyone leaves or they close at 8pm). Once a month, this is advertised as part of SCRABBLE® Meetup. What: Bring your own equipment (boards, tiles, clocks, score sheets, writing implements). No fee for playing these games! 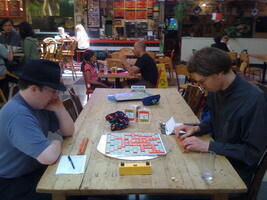 Who: Usually about 6-10 people show up (many of them regular Seattle Scrabble club members). All players are welcome! West Seattle Scrabble Club meets 2nd and 4th Wednesdays at Chaco Canyon Restaurant (3770 SW Alaska St) from 5pm until 9pm. Founded and directed by Claudia Finn and Tod Taylor. They follow tournament rules, charge $2 per night, and give out a few prizes. 1st & 3rd Friday Evenings: at Fado Irish Pub in downtown Seattle, starting at 6 PM. These gatherings are limited to the Collins dictionary, but they need not be limited to regular Scrabble. There could well be participants eager to play denscalating Clabbers, or if we have an odd number, perhaps some would choose to play anagrams. It's all about having a good time and celebrating the international lexicon. Organized by long-time Seattle clubmember Walker Willingham. Thursday afternoons: Shoreline-Lake Forest Park Senior Center (18560 1st Ave. NE #1, Shoreline) 12:00 to 4:00pm. Very casual, recreational group. Some use clocks, some don't; some play by the tournament rules, some don't. Play 2, 3-person games. Fee $4. Page 2 Books in Burien hosts a monthly Game night. These have been on Friday, but contact them for specific dates. 1st and 3rd Monday evenings: Magnolia Community Center (2550 34th Ave. W, Seattle) 6:30 to 8:30pm. Very casual, recreational group. They use word lists, play 2, 3, and 4-person games, no clock, no fee. [note: On the 2nd and 4th Mondays they have a "General Games" night where they play everything but Scrabble, e.g. : Boggle, Rummykub, Yahtzee, Sequence, Backgammon, Pit, Chess, Dominoes, etc.] Bring your own equipment if you have it. Contact (Scrabble nights, 1st & 3rd Mon): Miki Allen. Contact (non-Scrabble game nights, 2nd & 4th Mon): Frieda Toppozada. SCRABBLE® Française: A small group meets the first Friday of every month at 7:00 PM and the third Saturday at 10:00 AM at the Alliance Française de Seattle, Suite 205, The Good Shepherd Center, 4649 Sunnyside Avenue North. Note that Suite 205 is the official address of the AFdeS, but actual meeting room varies. Often they meet in the library, which is kitty-corner across the hall, but it should be obvious where they are. Also, there are two parking lots on the property. No fee for playing these games--and they provide equipment. For more info, contact Bob Mauritsen. Several bars, pubs, and coffee houses in the area have a "Game Night" where they encourage patrons to come and play various board games or quizzes (sometimes folks play SCRABBLE®). Here are some we've heard of (these tend to change, so contact the venue for more details). Mulleady's Irish Pub & Restaurant in Magnolia has "Board Game Night" every Monday. Wayward Coffeehouse in Greenwood encourages board game players 2nd and 4th Fridays. Note: the prize moratorium began with the 7 October 2014 club session. From that point on, the only prizes that will be given out will be just $1 for each Category word. In March 2015, we evaluated the club's cash flow to determine if we could afford to give out any other prizes and at that point decided to continue with just the $1 category prizes, but also stop charging the Statistician (Ken) and Director (Rebecca) weekly club fees. This allows the club to remain in a positive cashflow situation. In June 2015, we will look again at the club finances and discuss how monies in excess of the club expenses and reserves should be spent. Some possibilities: subsidize a celebration in honor of the 30th year of the club, add some weekly prizes, etc. As of August 2018, we have stopped giving out any cash prizes. Also, Club Statistician (Ken) and Director (Rebecca) will pay a reduced ($4) fee. We give out several prizes during the evening. For the first three games a Category is chosen and whichever play best fits the category wins the prize. Sometimes the category is a theme (e.g., "Halloween", "sports", "food", "things that are yellow", "something you wouldn't want to find in your house", etc. ), other categories are for the highest scoring play of certain type: "high Q", "high out-play", etc. *Note: if you are playing White Card, but your average is below 365, then you just need to get 3 bingos in a game--not 3 in a row. Even though I have no way of knowing this without attending, I somehow feel compelled to ask about "cards." Would you please explain "cards" to me? Our club pairings are based on a tier system. Blue cards are for members who average under 365 points a game (based on a twelve-game average). White cards are for members who average at least 365 points a game. Members who average under 365 points a game may choose to "play up" by having "white card" people as opponents, but "white card" people may not elect to play blue card people for the rest of the evening: it makes the blue card people kittenish. The first game is not subject to pairing, so you'll see blue card and white card people play each other then. Average score is computed for the calendar year, and starts over January 1st. You can find your average (and that of anyone else who has played at least 12 club games) on our Stats Page. Cutoff history: it was 350 until 2002 or 2003, when it was raised to 360. The next change was February 2006, when it was increased to 375 (in anticipation of higher scores with the addition of QI and ZA to the word list). The most recent change (from 375 down to 365) became effective 1 January 2007. I think I might get thrashed if I attended your club for the first time. What pointers could you give me that will give me some initial preparation? I will gently tell you that each of us has sustained horrible losses, and our psychological scars from our early SCRABBLE® Brand crossword game club sessions have healed. You're not an idiot if it takes a while for you to actually win a game, but you might be one if you try to tackle our experts the first time you encounter SCRABBLE® play outside of "kitchen table play", expecting to beat them. I suggest asking each regular club member how long s/he has been playing, and how s/he improved. To make it easier on your first time at club, we give you word lists (you can use them during play on your first night, and future sessions until you win a game at club). You also get free challenges and there are no overtime penalties your first time. See our New Player Info page for an overview of the basics of club. We also have a One-Page Rules Summary [pdf] that will get you started. three-letter word list, including definitions, also maintained by Rick Wong. Check out our Study Tools Page for LOTS more study tools and links to word lists. The score cards you fill out each night are sent to our Statistician, who enters all the game results, high scores, triple-triples, etc., into a stats program that generates the summary for each club night, and the updated standings for the year. Data that are posted include: average score, average spread, average number of bingoes, average score of your opponent, average number of bingos by your opponents, etc. Our Statistician is Ken Clark (he took over at then end of August 2011). Filling out your card legibly, with the date and full names of your opponents makes his job easier. You might want to let him know how much you appreciate the work he does for us every week. From June 2007 to August 2011, our Statistician was Mike Frentz. From January 2006 to June 2007, our Statistician was Doug Kruyt. Even though Doug was not able to make it to club much, he still did our stats every week. Not only that, but since Doug travels for work he often had his wife scan the score cards and email them to him so he could do the stats on his laptop computer on the road! Talk about dedicated. But all good things must come to an end, and Doug is happy we've found a replacement. Our Statistician Emerita is Christina O'Sullivan. She did the stats for club every week for 7 years(! ), for which we are very grateful. Next time you see her, why not share some appreciation? Before Christina, Ken Clark did the stats. All statisticians have used (and continue to use) the PC-based Focus program created by Steve Oliger. Thanks Steve! Our club director is Rebecca Slivka. Rebecca directs most club sessions, updates the website, and has organized the annual multi-day Emerald City tournament since 2004. If Rebecca is not able to attend club, either Ken Clark or Jane Bissonnette will supervise the club session. Jane Bissonnette passed the director's test in 2006 and began directing one-day tournaments for the club in 2007. Lynn Dreyer is our most recent member to become a director. In the fall of 2008, Lynn started an official SCRABBLE® club in Tacoma (Tacoma club is defunct since Lynn moved to Seattle in early 2014). Ken Clark (one of the club's founding members) directs club sessions on a fill-in basis. Lynn Dreyer directed the 2011 Emerald City Tournament November 11-13th. The club was started in August 1985. The founding directors were Ann Ferguson and Mark Oppenheimer. Ann's mother, Bess Warren, and Ken Clark were the first people to attend. Starlite Clark and Julie Lopez became directors in 1998-1999(?). Rebecca Slivka has been the club director since January 2001. We'll miss Mike Frentz, who was our Club Statistician from June 2007 to August 2011, and helped direct tournaments starting in January of 2008 (after passing the director's test in 2007). Club Fee is currently $10 per week. We had raised the rate by $1 in August 2018, but then our rent went up, so we increased it to $10 in late February 2019 to cover the difference. Before then: the weekly session rate went up one dollar, to $7 per Tuesday, on 17 October 2017. The last previous increase was on 6 July 2010, when the weekly session rate went up one dollar, to $6. For more info, see the News page. June 2004, club moved from Fare Start Restaurant (previously called "Common Meals") to University Friends Meetinghouse. Last held in 2003, the Northwest Bookfest provided booth space for the Scrabble Club every year. This was a great recruiting tool for the club. We miss Bookfest and hope it will return some day. 2005 tournament moved to Red Lion 5th Avenue. 109 participants makes 2005 the largest ever. 2006 tournament was also held at the Red Lion, with 102 players. 2007 first one-day tournament Feb 3rd. Jane Bissonnette continues to direct more one-day tournaments. 2011 will be the 22nd Emerald City tournament. OWL3 = OTCWL2014 goes into effect 10 April 2015. Information on this page may not be updated to include the new words. For printable word lists and cheat sheets using the new words, please visit the Study Tools page. *according to the Official Tournament and Club Word List, 2014 Edition (aka OWL3), effective 10 April 2015. Check out our Study Tools Page for more tools and links to word lists. Starting 10 April 2015, the official word list for North American SCRABBLE® club and tournament use will be the The Official Tournament and Club Word List, 2014 Edition (also known as OCTWL2014 or just OWL3). This update to the OWL adds 4 new 2-letter words, 66 new 3-letter words, 184 new 4-letter words, 465 new 5-letter words, etc., (over 9,000 new words!). For lists of the new words, cheat sheets you can print out, ERRATA, etc., check out the OWL3 Transition section on our Study Tools page. Word lists and links on our Study Tools are marked with +OWL3 to indicate they have been updated to include the new words. Starting 1 March 2006, the official word list for North American SCRABBLE® club and tournament use will be the The Official Tournament and Club Word List, 2nd Edition (also known as OCTWL2 or just OWL2). This update to the OWL adds 5 new 2-letter words, 44 new 3-letter words, 128 new 4-letter words, 303 new 5-letter words, etc., (over 10,000 new words!). For lists of the new words, cheat sheets you can print out, ERRATA, etc., check out the OWL2 Transition section on our Study Tools page. Most word lists on our Study Tools have been updated to use OWL2. OWL3: The next update to the word list (OWL3/OTCWL2014) will be effective for tournament and club play starting 1 December 2014 10 April 2015. See: Study Tools page for OWL3 Transition Word Lists and links. North American SCRABBLE® clubs and tournaments use The Official Tournament and Club Word List, a lexicon used from five U.S.A. (no Canadian) English-language abridged dictionaries. This word source is available only to members of the National SCRABBLE® Association. This book no longer contains word definitions, but does contain all valid root words of up to nine letters in length and their extensions. On 24 June 2014, NASPA announced (on Facebook) that the new word list, OWL3, will be effective for tournament and club play starting December 1st. The release date is scheduled for August 11th at Nationals, and NASPA will be selling the hardcopy there (in Buffalo). For those not attending Nationals, John Chew said: "the word list will be available for sale through our [NASPA] website by the end of August." An update to Zyzzyva should be available shortly after Nationals, as well. NASPA Dictionary Committee had announced that the next update (OWL3) would be available in 2013, but that obviously is not happening. The best guess for the next update is sometime in 2014 or 2015, but there is no information available now. With the demise of the National Scrabble Association (effective 1 July 2013), the printed Official Tournament and Club Word List is now only available to NASPA members and must be ordered by phone from Merriam-Webster (1-800-828-1880). It is not clear if the Long List is still in print or available. If you don't need a printed version, your best bet is to download Zyzzyva or use one of the other digital study tools that has the word list. NOTE: Starting 1 March 2006, the official word list for North American SCRABBLE® club and tournament use will be the The Official Tournament and Club Word List, 2nd Edition (also known as OCTWL2 or just OWL2). North American SCRABBLE® clubs and tournaments use The Official Tournament and Club Word List, also called the OWL (Official Word List). The Official Scrabble Player's Dictionary (OSPD) is used for School and Recreational play only. The newest (red) OSPD (OSPD4) came out June 2005; the corresponding update to the tournament list, OWL2, was published in early 2006 and became the official word source March 1st, 2006. OWL/OWL1 = "Official Word List" and TWL98 = "The Word List 1998" both refer to the same thing, The Official Tournament and Club Word List authorized by the North American SCRABBLE Players Association for adjudication of challenges in club and tournament play. This list was updated in 1998. It contains words from 2-9 letter long (and their extensions). OWL2 is the most recent edition of The Official Tournament and Club Word List that went into effect March 1st, 2006. It is the word list currently being used in club and tournament play. See What word source do you use? for info on purchasing OWL2. LWL = "Long Word List" was published in 2004(about) and contains words 10-15 letters long. It is being used (along with OWL2) to adjudicate club and tournament play. No new update is expected any time soon. OSPD# = "Official Scrabble Player's Dictionary, #th edition". OSPD is the "Official word source for Recreational and School Use". OSPD2 is very old. OSPD3 is equivalent to OWL1/TWL98 EXCEPT that about 200 "offensive" words that ARE in OWL/TWL98 were REMOVED from OSPD3. These were/are STILL in OWL/OWL2 and are valid in club and tournament Scrabble. I won't go into detail here, but suffice it to say that NSA succumbed to the pressure of censorship and removed some words. Another difference between OSPD and OWL is that OWL has words 2-9 letters long (and their inflections), wherease OSPD has words 2-8 letters long (and their inflections). OSPD4 was published in June 2005. OWL2 and OSPD4 are comparable (like OSPD3 and TWL98), except that not only have some few hundred "offensive" words been once again omitted from OSPD4, but there are also another hundred or so trademark words and other words that were not in the first printing of OSPD4 but ARE in OWL2 (see expurgated word list for words acceptable for club & tournament play that are not listed in the OSPD4). Note also, that OWL/OWL2/TWL98 are all just WORD LISTS, where words are listed strictly in alphabetical order--making it easy to find whether or not a word is listed. OSPD3/4 are dictionaries (albeit with limited definitions), but they group related words and inflections. It's handy to use OSPD4 to look up a word to find a meaning (as long as you aren't looking for an "offensive" word), but it is not valid for word judging at clubs/tournaments. All these lists are used for play in North America. Most other english-speaking countries use a UK-based dictionary (used to be Chambers, now it will be Collins) for their word adjudication, and call their word list OSW = "Official Scrabble Words". There is a large overlap between OWL/OSPD and OSW, but significant differences (words that are in one but not the other). For international (read North America + rest of the world) tournament & club play, a merged OSW+OSPD = SOWPODS word list was created. A vote among NSA membership about 5 years ago on whether to switch from OSPD-based word list to SOWPODS was defeated. So, unless you plan on qualifying for the World Championships or playing outside of North America, you can stick to OWL. For more info on the "SOWPODS" debate, I suggest a google search. If you are playing at (or practicing for) club and tournaments, then use the OWL. If you are playing with friends, just agree before you start the game which word list you will be using. What if my opponent plays something that I think is not really a word on the board? Can I challenge it? How? OLD way: Raise your hand and call "CHALLENGE!" An accredited Word Adjudicator hastens to your side to rule on the play, deeming it acceptable or unacceptable after consultation of the The Official Tournament and Club Word List. Of course, if you still are not satisfied with the rule (perhaps the adjudicator is drunk or insane or has poor reading comprehension skills), you may request a second opinion. If one word of the play has over nine letters, the Long List may be used as a word source. New way: After you say "challenge" and neutralize the clock, you and your opponent put your tiles face down on the table and walk over to the Word Judge Computer. The player challenging the play types in ALL the words being challenged, then the player being challenged presses the Judge (TAB) key. Thanks to Michael Thelen for creating Zyzzyva - a great program both for study and word adjudications. If you're not sure if you want to challenge or not, you can say "HOLD!" which prevents your opponent from drawing new tiles while you think about whether or not to challenge. You might want to put your hand on the tile bag to make sure your opponent understands you are holding their play. To release a hold, say "I accept the play". Detailed rules are spelled out in the Official Tournament Rules. There is a formal procedure for adjudicating challenges (see What if my opponent plays something that I think is not really a word?). Only the Director, or designated staff, or an authorized computer program may rule on the validity of a challenged play. The guidelines for acting as word judge are detailed in the Official Tournament Rules. If you want to become an authorized word judge, familiarize yourself with the rules regarding Adjudicating Challenges Manually then take the Word Judge test (ask your director). Note: with the advent of Adjudicating Challenges by Computer [a.k.a. "Software Self-Lookups" or SSL], unless there is a power failure the only time you'll see a human word-judge is to facilitate players with mobility issues who can't easily get up and go to the computer. Clubs and tournaments use the Official Tournament Rules of the North American SCRABBLE Players Association. These rules are essentially just an extension and refinement of the rules that come in your typical SCRABBLE® game; they detail specific procedures for drawing tiles, scoring, challenging, using clocks, handling overdraws, etc. You are responsible for reading, understanding, and following the Official Rules during Tournament and Club play. You can review them online any time, or print out a copy for yourself. With the changeover from NSA to NASPA, the NSA Policy on Disruptive, Intimidating and other Unacceptable Behavior has been replaced by the NASPA Code of Conduct. 1 July 2013 News flash: NSA closing down, Hasbro takes NSA functionality inhouse. NASPA unchanged. More details on the News page. Hasbro (owners of the SCRABBLE® game in North America) announced in 2008 that they would drastically reduce their funding of competitive Scrabble. As of January 1, 2010, Hasbro will no longer be providing regular funding to SCRABBLE clubs and tournaments. As a result, over the course of 2009, the National SCRABBLE® Association (NSA) will transfer responsiblity for clubs and tournaments to the newly formed North American SCRABBLE® Players Association (NASPA), leaving the NSA to concentrate on "developing new markets for SCRABBLE in areas such as School SCRABBLE." Annual Player membership fee in the NASPA will be $30 (up from $20/$25 in the NSA). The memberships are good for calendar year (Jan 1-Dec 31), but they are trying to soften the blow by making the initial NASPA membership good until the end of 2010. NASPA membership is required to compete in NSA/NASPA tournaments starting July 1st. NOTE: From now until July 1, you have to be either an NSA or an NASPA member to compete in tournaments--so if your NSA membership is about to run out, you only need to join the NASPA from now on. Memberships purchased on or before December 31, 2009 have an extended initial term: your membership will be valid from the receipt of your dues through December 31, 2010. After that, each membership term is up to one calendar year (from January 1 through December 31). The old Tournament rating fees will be replaced by a "Tournament Participation Fee". The existing fee structure is a fixed amount per player per tournament ($1 per player per Local Club tournament, $1.50 per player for an open-rated tournament with 16 games or fewer, and $1.75 per player an open-rated tournament with 17 games or more). The new fee will be $.50 per player per tournament game. For example a one-day 8 game tournament under the NSA would cost $1.50 per player; but the new fee will be $4.00 per person. A three-day tournament with 20 games would cost $1.75 per player under the old system, but $10 per player with the new one. Players should expect that tournament entry fees will be raised and/or prize payouts will be reduced to accommodate this change. Annual $30 fee for NASPA sanctioned clubs (also due starting July 1st). Also, Directors must be current members of NASPA for their clubs to retain active, sanctioned status. Well, if you just come to club you shouldn't notice any change. We have enough money in our club fund to cover the annual sanctioned club fee so that is no problem. If you attend tournaments, expect to pay a little more for your NASPA membership (sign up by July 1st for the best deal to start with! ), and expect to pay $5 to $10 more for every tournament you enter. For the latest info check out the NASPA website: www.scrabbleplayers.org. Note: it might take a while for this website to be updated to change all the "NSA" references to "NASPA", where appropriate. Links to information currently on the NSA website will be changed to the relevant location on the NASPA website as the transition progresses. It's gonna be a while, so look at NASPA website for the final word. Several players dissatisfied with the North American SCRABBLE Players Association (NASPA) announced in January 2010 that they were starting up an independent player's organization. The name of the new organization is Word Game Players Organization, or WGPO. In March 2010, we posted a news item about WGPO giving a brief overview of the issues/status at that time. The issues behind the schism include concerns about how NASPA is governed, communication issues, increased cost of tournaments, and how NASPA income is spent. Since then, WGPO has become more organized. They launched a website, announced and voted on bylaws, and have started to rate their own tournaments. Visit the WGPO website for more background. You can also get the latest updates by joining the WGPO Yahoo discussion group (note: you don't have to join WGPO to join the discussion group). What does this mean for you as a SCRABBLE® player? If you are just attending club, there isn't any impact. As far as tournaments go, some directors have announced they will be running their tournaments under the auspices of WGPO instead of NASPA. They are currently still using NASPA rules, so the only difference so far is that WGPO is doing the rating (so you'll have a separate rating from your NASPA rating), and WGPO is not charging a rating/participation fee. All upcoming Seattle tournaments will be NASPA sanctioned and rated. You mentioned the National SCRABBLE® Association. Do I need to become a member? No. If you want to play in tournaments, then YES, you'll eventually need to become a member of the NSA. However, you can wait until after your first tournament to become a Member of the National SCRABBLE® Association. For U.S. residents, the membership dues are $20 per year. With membership you receive the most recently edited version of a national club list, Official Tournament Rules, and a one-year subscription to the SCRABBLE® News. You can also register or renew your membership online. Annual Player membership fee in the NASPA is US $30. Find a printable NASPA membership form and online payment options at the NASPA Membership page. For more info about transition from the NSA check the NASPA website FAQ page. To become a rated player, you must play in an NASPA-sanctioned tournament. You must be an NASPA member to compete in sanctioned tournaments. You can find a list of all NASPA-sanctioned tournaments in North America by looking either on the NASPA website or on cross-tables.com. The Seattle Club usually hosts one multi-day tournament a year. Previously it has been held over Memorial Day Weekend, but starting in 2010, it will be on the Veteran's Day/Rememberance Day holiday. Read all about it on our Emerald City Tournament Page. Starting in 2007, Jane Bissonnette has also been hosting single-day tournaments. You cand find complete details, including online registration, for the next one-day'er on our Tournaments Page. Additionally, there are annual Club Challenge tournaments between the Portland and Seattle, and between Vancouver and Seattle. Check the Tournaments Page for details. Look on our Tournaments Page for a list of upcoming tournaments in the neighborhood. You can also find a map-based view of upcoming tournaments on cross-tables.com. You enter your first tournament as an "unrated" player. Your rating is computed based on your performance in an NASPA-sanctioned tournament (how many wins, ratings of your opponents). Here is a more detailed explanation: John Chew explains ratings. Your rating is used to position you in subsequent tournaments. Some tournaments use ratings cut-offs to separate divisions (like our Emerald City tournament), others use fixed division sizes with people ordered by rating (like our one-day tournaments). You must have an established rating to play in the annual National Scrabble Championship Tournament—known in 2006 as the US SCRABBLE® Open—but all others are open to unrated players. The North American SCRABBLE Players Association sanctions two different types of tournaments: Open Rated Tournaments (ORT) and Local Club Tournaments (LCT). ORTs are fully rated, whereas LCTs are rated using 1/3 the value of an ORT. This means that your rating will only change by 1/3 as much in an LCT as it would in an ORT. Each ORT must be approved by the NSA at least 8 weeks before it is held. There is no time restriction on LCTs. The Director is the person who oversees a club or tournament session and ensures that NASPA rules and procedures are followed. If you wish to run a sanctioned NASPA Tournament, start your own official SCRABBLE® club, or direct at an existing club or tournament, you need to become a sanctioned director. To become a Director, you must first be a member of NASPA. You then need to follow the Director Certification process (order and complete the test, etc.) for approval. Thoroughly review the Director's Manual and the Official Tournament Rules before taking the Director's Test. The Internet SCRABBLE® Club - Most popular site for NASPA members (but lots of others play at ISC as well). Check out our Club Roster to see ISC handles of club members. Only play people you know, or those who identify themselves as NASPA/NSA/tournament members (The antisocial jerks and cheaters usually don't identify themselves). You can view our Club Roster to see ISC handles of club members. Use the "finger" command (e.g, "finger slugbiker") to view a player's profile. The Finger command will show you whatever the player has posted in their finger notes, their unfinished games status, if they are a supporting member, etc. Be sure to identify yourself in your own finger notes, too. Join the "TPG" (Tournament Player's Group) on ISC (available only to NASPA/NSA members) and then you can use the gseek TPG command to send a seek request to other TPG members only. You can set the Fair-Play Agreement to attest that you won't be using anagrammers or looking up words while you play, but seeing it set by someone else doesn't guarantee they won't cheat--just that they can't run Quackle, Zyzzyva, or other anagram/study programs while they play. And Mac users are unable to set FPA at all. Some players who got tired of folks accusing them of cheating on ISC created the website www.iamnotcheating.com to explain in a humorous and biting way that just because you lose to someone it doesn't mean they are cheating; it could mean that they are better than you. In keeping with the times, we now have a Facebook group for the Seattle Club. If you are already a Facebook member, you can just join the Seattle Scrabble Club Group on Facebook. We'll use the group as a way to advertise our club, and as another way for club members to keep in touch, post images, etc. Feel free to sign up, write on the wall, start discussions, and all the other Facebook-y things. CGP is the nickname of the Yahoo Group "Crossword-Games-Pro" email list. If you join CGP, you'll get to exchange information with other competitive Scrabble® players, hear the latest gossip, find out about upcoming events, get study information, etc. As with any email bulletin board, passions can run high so tread cautiously and remember that lots of people read these posts. Sherrie Saint John is the organizer of the CGP list. To find out more about CGP (including how to join), please check out Sherrie's CGP info page.